I heard about this on MPR Marketplace this morning while on the way to work. It's a 3D pen that writes in the air. Then I got to work there was a mention on The Presurfer of the pen. They had a Kickstarter page and they were looking for $30,000. It was at $900,000 when they did the story, not when it aired this AM, now it's up to $1.2 million. It's kind of neat thing but not sure I would need one. I'm finally getting to the end of the Godzilla series. I was thinking tackling the rest of the Japanese monster movies after that but I'm taking a break and going back to other genre's of SF movies. Godzilla: Tokyo S.O.S.is the 27th movie and it was released 12-13-2003. It continues from the previous movie. The government is repairing Kiryu while wondering if there is a reason to continue with the expense. Kiryu is the Mechagodzilla built over the real Godzilla's bones. The Mothra girls come to an old guy they had meet before and tell him to warn the government that they need to chuck the dead Godzilla's bones in the sea. The bones are attracting the big guy will keep coming back for them. Mothra will turn against the human's if they continue on this path. A giant dead sea turtle washes on shore. Looks rather Gamera like. We see the slashes on his next from some giant claws. Ooohhh, huh. The humans are kind of annoying, all noisy, and they don't listen to Mothra. Godzilla does show up and the old man and his grandson call Mothra for some help. It's a nice looking CGI Mothra that show sup. Looks really great. MechaGodzilla shows up and there's more fighting. The huge battle eats up a lot of the movie but is pretty entertaining. MechaG takes over it's own control and grabs Godzilla. They drop into the sea and the movie closes, after some human nattering, with a shot of a secret store of monster DNA. Oh, oh. The movie is more entertaining that the story it tells. The people don't have a lot to do and you've seen it all before. The effects in general are pretty nice and the soundtrack doesn't bother me any. There's a US edition from Columbia TriStar. It's letterboxed, looks pretty good, and has both Japanese audio with English subs and an English Dub version. I don't care for the dubbing very much. I've also got a Video Daikaiju bootleg dvd that is fan subbed that's pretty close to the US version. Worth a gander for the monster fa. The weak story line is bouyed up by the great battle scenes which make it better than average. The 28th and currently last Godzilla film, Godzilla: Final Wars, came out in 2004. Ryuhei Kitamura is the director. I wouldn't have guessed he'd be directing a Godzilla movie, he does a fairly good job, expecially with the monster action. His script isn't anything special, back to the invading alien theme. Monsters seem to be popping out of the ground all over the world. They are trashing lots of stuff and the earth looks to be in trouble. Some aliens appear, they collect the attacking monsters, saving the earth. It's too good to be true of course and soon enough the aliens are outed. They are inhuman critters, in men suits, out to get their munch on. People are one of the alien's main food groups. Damn, that's some payback for being an animal eater, huh. It's slightly in the future of the rest of the series and it turns out that this Godzilla universe has mutants with special powers. They were rounded up and are now working for the Earth Defense Organization. That will be important in the fight to get rid of the aliens. There's a good bit of action and that was fun enough. I watched the bootleg dvd I had and part of the English Dub I got off of On Demand. There's a US version I hadn't picked up yet. I'm not in a big rush. That's cutest robot I've seen in quite a while. 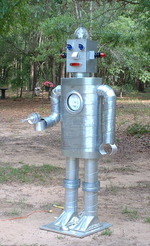 That's a tweenbot and he's the project of this artist lady named Kacie Kinzer. She built a cute robot that moves in a straight line. She plopped him down with a flag asking the city citizens to keep an eye on him and help him get to his destination. He made it everytime. She took video of him and there's a clip and more pictures of him at her site. I think this project is really great. It sure made me laugh. I'd like to be somewhere and have this delightfull little robot go by. This is the kind of stuff that makes me most happy to be a human being. Not so much of the rest. Here's a robot reading I, Robot. You wouldn't think he had that much computing power. He's probably just skimming it. That's a pretty ugly robot in a cute picture. Over on the right is this cool wooden robot. I like the fact that he's that orange color. And that he's so square and round at the same time. And he's made of wood. What kind of message is that? His look, to me, is a throw back to the robotic style of the early part of the 20th century. And he's made of wood. You can't get much more solid than that. What a stand up guy. As a contrast, here is a robot, on the lower right, that looks pretty fucked up. What's he on? It's a rocket. A rocket filled with robotic crack, or mechanical goof balls. I liked that blue tin man robot. Man size. Old school. He looks like something you might find on a 1930's or 1940's black and white serial. Except, here he's in color. And he's man size. The trouble with making large things? They are large. Man size. Where do they go once you have them? What if you have 2, or 9? Yeah. Didn't think of that, did ya. That's based on a conversation with a real artist who was sadly coming to that realization. These few pictures are much easier to store.